Prestonwood’s upgraded audio system includes Clair i218 line arrays, flown Clair CS218 cardioid sub-low arrays, Clair’s new high-Q 15CX for in-fill and balcony coverage, Lab.gruppen PLM series amplifiers, and Studer digital consoles.Clair Brothers Audio Systems, headquartered in Manheim, PA, recently completed its largest house of worship project to date at the 140-acre Prestonwood Baptist Church site in Plano, TX. The upgrade to the 7,500-seat worship center located within the main 800,000-square-foot facility included a sound reinforcement system rated at close to half a million watts and with nearly 2,000 inputs and outputs, plus a production studio rebuild. According to Gene Pelland, executive vice president of corporate sales for Clair Bros., the church had outgrown the capabilities of the point-and-shoot audio system that had been installed when the building was completed in 1998. The search for a replacement system was over when Clair Bros. arranged for church leaders to see a Sting concert featuring the company’s proprietary equipment. “They pretty much came back saying ‘That’s what we want in our auditorium.’ They could have bought less dynamic equipment but they wanted the very best that we could offer,” Pelland said. “Their video system has gone through numerous upgrades, but it was time to bring the audio system into the 21st century. The system backbone needed to be scaled to make sure it would have the flexibility to handle the various production demands,” elaborated Jim Devenney, system designer for Clair Bros., referring to the church’s large-scale holiday productions. The Christmas show, for example, typically includes a 48-piece orchestra, 350-member choir, praise vocalists, actors, comedians, and even the occasional camel. R. Todd Bell, worship pastor at Prestonwood, appointed Bobby Reynolds, the church’s engineering and technical supervisor, to oversee the project. Reynolds teamed up with Devenney and Mike Mason, site project manager, and also brought in the church’s chief audio engineer, Chris Schutz, and audio engineer Armando Escobedo to help develop the new system. The newly installed system includes Clair i218 line arrays, flown Clair CS218 cardioid sub-low arrays, Clair’s new high-Q 15CX for in-fill and balcony coverage, Lab.gruppen PLM series amplifiers, and Studer digital consoles. “We also installed a new Roland headphone monitor system, three 15CX and two Clair R2-T flown choir monitors, 18 Clair 12AM floor monitors, new floor sub-lows, and front fills,” Devenney added. Representatives from Studer visited the Clair Bros. manufacturing facility to update firmware and pre-commission the console systems. Schutz and Escobedo also flew in for training and to program the consoles. 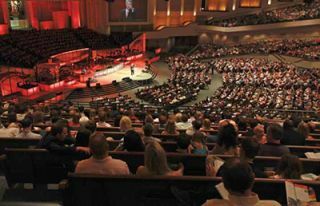 Because Prestonwood attracts so many worshippers every weekend the church could not be without a sound system in the sanctuary. “We were able to supply a large portable system for the church to use during the removal of the existing system and installation of the new system so they could stay ‘online’ at all times,” Devenny said. The upgrade of the production studio was notable for being the first implementation of ZR Prefab acoustic treatment panels, a collaboration between Clair Bros. and acousticians Delta H Design of Culver City, CA. Clair Bros., led by site supervisors Dave Walker and Ron Sadd, stripped out the studio and rebuilt it using ZR panels, manufactured in Manheim, for walls and ceiling. Custom-sized panels were built at the Clair warehouse in Dallas, TX. The entire project took roughly nine months from design to completion. The sound system changeover took three weeks, console changeover took one week, and the studio rebuild was a four-week project.